Whose life is it (on screen), anyway? The biopic is a genre that never gets old; it’s a regular at Oscar-nomination time (“Milk,” “Capote,” “Ray,” “The Aviator”) and at the multiplexes, with “Public Enemies,” about notorious ’30s gangster John Dillinger, arriving in theaters Wednesday. Later this year, we’ll see more real lives on screen: “Julia & Julia” (about chef Julia Child, played by Meryl Streep), “Amelia” (aviator Amelia Earhart, played by Hilary Swank), “Coco Before Chanel (designer Coco Chanel, played by Audrey Tautou), among others. But what about the lives we haven’t yet seen on screen? I was intrigued to read, in the press notes for “Cheri,” that screenwriter Christopher Hampton (“Atonement,” “The Quiet American,” “Dangerous Liaisons”) has long been working on a life of Colette for the screen. The one-named French writer (she was born Sidonie-Gabrielle Colette, but began using only her last name as a teen), led a busy and very screen-friendly life, which included literary fame, notorious sexual alliances — including an affair with her stepson — and questionable alliances during World War II. I just read Judith Thurman’s biography of her (inspired after watching “Cheri”) and immediately wondered: why isn’t this woman on screen? Likewise, I just finished reading a volume of letters from the six erudite, adventurous Mitford sisters (Nancy, Pamela, Diana, Unity, Jessica, Deborah — of whom only Deborah is still living), whose lives spanned the 20th century and whose friends encompassed the likes of Adolf Hitler, Ava Astaire, Maya Angelou, Evelyn Waugh, and the British royal family. Again, where’s the movie? Is there any life story you’ve been waiting to see on screen? Do tell. 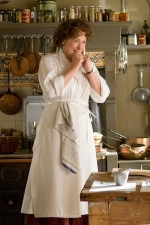 In the meantime, here’s Meryl as Julia; doesn’t she look jolly?